4Life Probiotics doesn’t require refrigeration and the easy-to-carry blister pack makes it convenient to take along anywhere. 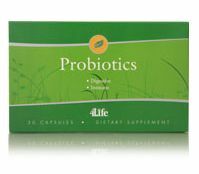 Our Probiotics is a concentrated formula that includes five strains of “good” bacteria, providing a wider range of probiotic support. Our Probiotics is manufactured to prevent heat, air and moisture from having an effect on the “good” bacteria. Expert manufacturing techniques provides 10 billion live bacteria at the time of manufacture and insure optimal live organism availability. Packaged in vegetable capsules, our Probiotics enjoy a longer shelf life.